Uncharted 2 May Have Raised The Bar For Game Development This Week, But Ratchet & Clank: A Crack In Time Could Push That Bar Even Higher Later This Month. Both the Ratchet & Clank and Resistance franchises have both been consistently top-tier exclusive titles on the Playstation 3, and they have a history of quality that dates back right to the early Playstation days. 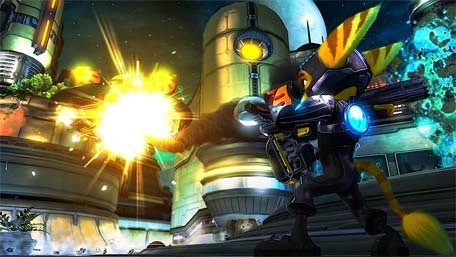 With Ratchet & Clank: A Crack In Time looking like the best Ratchet game yet, Insomniac still had time to praise their friends at Naughty Dog. With Ratchet & Clank: A Crack In Time due out in mere months, we're likely to experience two of this year's best games in the space of a month. We love you Insomniac and Naughty Dog.